CoachCare makes it simple and affordable for clinics to gain 24/ 7 insight into their patients’ lives outside the four walls of the clinic. LEVL’s fat metabolism tracking technology provides another way for patients and providers to gain a more complete view into their weight loss programs. Digital health solution provider CoachCare is announcing their integration with LEVL this week at the Obesity Management conference September 26 – 30 in Washington DC. LEVL is an FDA registered device that allows users to calculate, monitor and track fat metabolism through a single breath. LEVL’s fat loss insights combined with CoachCare’s custom-branded patient mobile app, clinical dashboard, and proprietary scales and trackers brings 24/7 insight into a patient’s wellness and weight loss journey, while monitoring all aspects of their programs, including fat loss insights, weight fluctuations, water and food intake, steps, sleep, pain and more. The LEVL device works with any prescribed diet when the body shifts into an elevated fat-burning state. Breath measurements are simple and non-invasive and results are delivered in 15 seconds. Patients can easily track their data through the LEVL iOS or Android app, and now, that information will seamlessly integrate into the CoachCare app and dashboard along with several other patient metrics, to provide a complete picture of the patient’s weight loss journey. “We are excited to integrate our technology into the CoachCare platform. This is a powerful partnership that will allow clinics and patients to better understand the real-time effects of prescribed weight loss plans. Tracking this personalized data alongside other biomarkers allows clinicians to adjust patient weight loss programs as needed to ultimately improve patient outcomes,” said Brent Hixson, LEVL CEO. Both CoachCare and LEVL will be exhibiting at OMA and invite attendees to stop by their booths to learn more about how this integration will be beneficial to both weight loss providers and patients alike. CoachCare helps health clinics across a number of specialties improve retention, referrals and revenue by encouraging 24/7 patient-clinic engagement and simplifying daily complexities for both clinic and patient through a custom-branded mobile app, clinical dashboard, and connected proprietary scales and trackers. LEVL has created a new paradigm in nutrition management and health through a non-invasive measurement of ketones using breath. The LEVL device enables clinicians to identify how a prescribed diet and exercise plan impacts their patient’s fat metabolism in real-time, enhances patient care by giving clinicians the ability to remotely monitor and keeps patients motivated with daily feedback. All it takes is a simple breath. For more information visit their website here. Seattle, Wash. — May 2, 2017— Memorial Day is around the corner, bringing with it the start of summer, a time when consumers across the country re-evaluate their wellness and fitness goals. Enter LEVL, a health and wellness device that can tell an individual’s current state of fat burning with one simple breath. The company today announced nationwide availability of LEVLhome, just in time for beach weather. 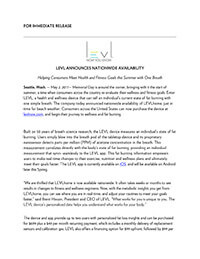 Consumers across the United States can now purchase the device at levlnow.com, and begin their journey to wellness and fat burning. Built on 50 years of breath science research, the LEVL device measures an individual’s state of fat burning. Users simply blow into the breath pod of the tabletop device and its proprietary nanosensor detects parts per million (PPM) of acetone concentration in the breath. This measurement correlates directly with the body’s state of fat burning, providing an individual measurement that syncs seamlessly to the LEVL app. This fat burning information empowers users to make real-time changes to their exercise, nutrition and wellness plans and ultimately, meet their goals faster. The LEVL app is currently available on iOS, and will be available on Android later this Spring. The device and app provide up to two users with personalized fat loss insights and can be purchased for $699 plus a $49 per month recurring payment, which includes a monthly delivery of replacement sensors and calibration gas. LEVL also offers a financing option for $99 upfront, followed by $99 per month for 12-months at no interest. At the end of the contract, monthly payments will drop to $49 per month for maintenance subscription. Additionally, the LEVLpro device is available to health and wellness professionals at levlnow.com and includes the LEVL device, LEVL app and the LEVLpro Dashboard, which helps track clients’ data either at a facility or with the client’s personal LEVLhome devices. The LEVLpro device can be purchased for $699 plus $149 per month recurring payment. Alternatively, the LEVLpro finance option is $199 down and $199 per month for 12-months with no interest. At the end of the contact, monthly payments will decrease to $149 per month for maintenance subscription. LEVL is on a mission to change the conversation about weight loss to one about fat loss. LEVL is a ground-breaking device that can tell an individual’s fat burning state with just one breath. Users simply blow into LEVL, and a proprietary nanoparticle sensor detects a molecule in the breath that indicates if he or she is burning fat. Armed with this personalized information, which works seamlessly with smartphones and is available immediately via LEVL’s app, users can make real-time decisions about their diet and exercise routines to optimize fat loss and wellness. Based on half a century of proven breath science research, LEVL makes monitoring a user’s fat burning state easy and predictable. All it takes is one breath. LEVL is a Class I medical device. For more information visit levlnow.com. 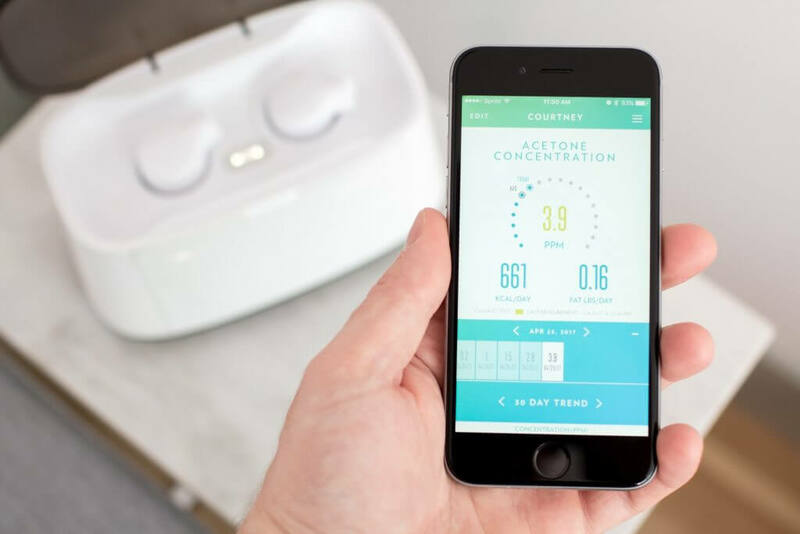 Seattle, Wash. — March 2, 2017—Seattle-based LEVL, a health and wellness device that can tell an individual’s current state of fat burning with one simple breath, today announced its much-anticipated introduction to the consumer market, LEVLhome. Consumers located in the Seattle area can now purchase the device at www.levlnow.com and begin their journey toward wellness and fat burning. Nationwide availability for LEVLhome will be announced later this spring. Built on 50 years of breath science research, the LEVL device measures an individual’s state of fat burning. Users simply blow into the tabletop device and LEVL’s proprietary nanosensor measures parts per million (PPM) of acetone concentration in the breath. This measurement correlates directly with the body’s state of fat burning, providing an individual measurement and seamlessly syncing additional insights to the LEVL app. With this information, users can make real-time changes to their exercise, nutrition and wellness plans. 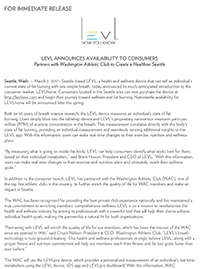 In addition to the consumer launch, LEVL has partnered with the Washington Athletic Club (WAC), one of the top five athletic clubs in the country, to further enrich the quality of life for WAC members and make an impact in Seattle. The WAC has been recognized for providing the best private club experience nationally and has maintained a true commitment to enriching members’ comprehensive wellness. LEVL is on a mission to revolutionize the health and wellness industry by arming its professionals with a powerful tool that will help their clients achieve individual health goals, making the partnership a natural fit for both organizations. The WAC will use the LEVLpro device, which provides a personalized measurement of an individual’s real time metabolism using the LEVL device, iOS app and LEVLpro dashboard. With this information, WAC nutritionists and personal trainers are able to track clients and accurately make decisions about their clients’ nutrition and fitness plans. The LEVLpro device shows biomarker insights that confirm the effectiveness of fitness and nutrition plans and compliments the WAC member experience. It also sets daily fat burn milestones and reduces time spent on nutrition and wellness plans that may not be working. LEVL is now available to consumers located in the Seattle area at www.levlnow.com. The LEVLhome device can be purchased for $699 plus a $49 per month recurring payment for sensor refills and calibration gas. Additionally, the LEVLpro device is now available to health and wellness professionals in the Seattle area at www.levlnow.com and includes the LEVL device, LEVL app, the LEVLpro Dashboard, which helps track clients’ data either at a facility or with the client’s personal devices. The LEVLpro device can be purchased for $699 plus $149 per month recurring payment. LEVL is on a mission to change the conversation about weight loss to one about fat loss. LEVL is a groundbreaking device that can tell an individual’s current state of fat burning with one simple breath. Users simply blow into LEVL, and a proprietary nanosensor detects a molecule in the breath that indicates if he or she is burning fat. Armed with this personalized information, which works seamlessly with smartphones and is available immediately via LEVL’s app, users can make real-time decisions about their diet and exercise routines to optimize fat loss and wellness. Based on half a century of proven breath science research, LEVL makes monitoring a user’s fat burning state easy and predictable. All it takes is one breath. LEVL is a Class I medical device. For more information visit www.levlnow.com. Washington Athletic Club (WAC) is a private club located in the heart of downtown Seattle on Sixth Avenue, between Union and University streets. The historic landmark opened in 1930 and has remained committed to its mission to enrich the quality of life of its members. The WAC is among the top five athletic clubs nationally and is an eight-time repeat winner of the 5 Star Platinum Club of America award. The WAC includes five floors of state-of-the-art athletic facilities, the Inn at the WAC, a wellness center, full-service spa, multiple restaurants, and private events space. For more information, please visit www.wac.net. 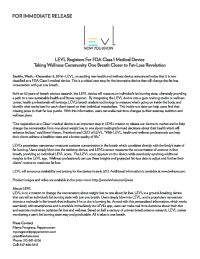 Seattle, Wash.—January 4, 2017—LEVL, a health and wellness device that can tell an individual’s fat burning state with just one breath, today announced the LEVLpro Solution, arming wellness professionals with valuable and individualized insights that will enhance their services and improve their clients’ outcomes. LEVLpro was recently unveiled at the Discover Blue event at CES. The LEVLpro Solution provides a personalized measurement of an individual’s real time state of fat-burning using the LEVL device and application. With this information, health and wellness professionals can quickly and accurately make decisions about their clients’ nutrition and fitness plans. The LEVLpro Solution shows biomarker insights that confirm the effectiveness of fitness and nutrition plans and compliments and adds to client interaction by providing enhanced accountability. It also sets daily fat burn milestones and reduces time spent on nutrition and wellness plans that may not be working. By integrating The LEVLpro Solution into a gym, training studio, nutrition center or wellness clinic, health professionals can leverage LEVL’s breath analysis technology to measure what’s going on inside the body, and ultimately help their clients achieve their wellness goals faster. Built on 50 years of breath science research, the LEVL device measures an individual’s state of fat burning. LEVL’s proprietary nanosensor measures parts per million of acetone concentration in the breath which correlates directly with the body’s state of fat burning. Users simply blow into the tabletop device, and LEVL’s sensor measures the concentration of acetone in that breath, providing an individual LEVL score. The LEVL score appears on the device while seamlessly synching additional insights to the LEVL app. Wellness professionals can use these insights and projected fat-loss data to adjust and further their clients’ routine to maximize fat loss. “LEVL is on a mission to revolutionize the health and wellness industry by arming health and wellness professionals with a powerful tool that will help their clients achieve their individual wellness goals,” said Brent Hixson, President and CEO of LEVL. The LEVLpro Solution includes the LEVL device, LEVL app, the LEVLpro Portal, which helps track clients’ data either at a facility or with the clients personal devices, on-going maintenance, replaceable sensors and calibrant, customer support, as well as training and education. It is available to health and wellness professionals for $199.00 per month with a 12-month agreement. LEVLpro will launch with a limited release in Seattle in January 2017. LEVL is on a mission to change the conversation about weight loss to one about fat loss. LEVL is a ground-breaking device that can tell an individual’s fat burning state with just one breath. Users simply blow into LEVL, and a proprietary nanosensor detects a molecule in the breath that indicates if he or she is burning fat. Armed with this personalized information, which works seamlessly with smartphones and is available immediately via LEVL’s app, users can make real-time decisions about their diet and exercise routines to optimize fat loss and wellness. Based on half a century of proven breath science research, LEVL makes monitoring a user’s fat burning state easy and predictable. All it takes is one breath. LEVL is a Class I medical device. 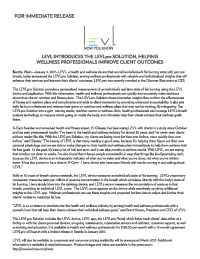 Seattle, Wash.—December 8, 2016—LEVL, an exciting new health and wellness device announced today that it is now classified as a FDA Class I medical device. This is a critical next step for the innovative device that will change the fat loss conversation with just one breath. Built on 50 years of breath science research, the LEVL device will measure an individual’s fat burning state, ultimately providing a path to a new sustainable health and fitness regimen. By integrating the LEVL device into a gym, training studio or wellness center, health professionals will leverage LEVL’s breath analysis technology to measure what’s going on inside the body, and identify what works best for each client based on their individual metabolism. This inside-out data can help users find that missing piece to their fat loss puzzle. With this information, users can make real-time changes to their exercise, nutrition and wellness plans. LEVL’s proprietary nanosensor measures acetone concentration in the breath which correlates directly with the body’s state of fat burning. Users simply blow into the tabletop device, and LEVL’s sensor measures the concentration of acetone in that breath, providing an individual LEVL score. The LEVL score appears on the device while seamlessly synching additional insights to the LEVL app. Wellness professionals can use these insights and projected fat-loss data to adjust and further their clients’ routine to maximize fat loss. LEVL will announce availability and pricing for the device in early 2017. Additional information is available at www.levlnow.com. LEVL is on a mission to change the conversation about weight loss to one about fat loss. LEVL is a ground-breaking device that can tell an individual’s fat burning state with just one breath. Users simply blow into LEVL, and a proprietary nanosensor detects a molecule in the breath that indicates if he or she is burning fat. Armed with this personalized information, which works seamlessly with smartphones and is available immediately via LEVL’s app, users can make real-time decisions about their diet and exercise routines to optimize fat loss and wellness. Based on half a century of proven breath science research, LEVL makes monitoring a user’s fat burning state easy and predictable. All it takes is one breath. 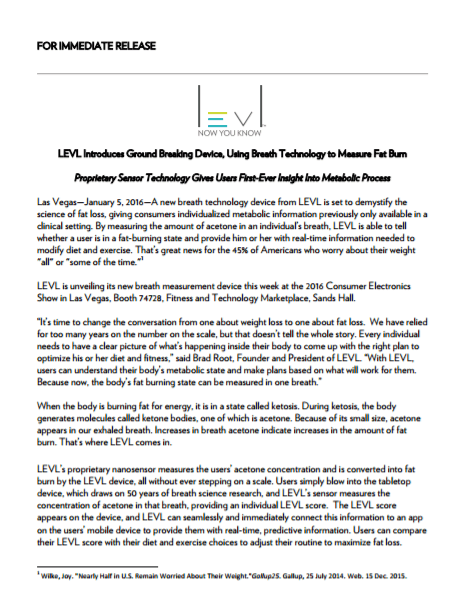 LEVL is unveiling its new breath measurement device this week at the 2016 Consumer Electronics Show in Las Vegas, Booth 74728, Fitness and Technology Marketplace, Sands Hall. When the body is burning fat for energy, it is in a state called ketosis. During ketosis, the body generates molecules called ketone bodies, one of which is acetone. Because of its small size, acetone appears in our exhaled breath. Increases in breath acetone indicate increases in the amount of fat burn. That’s where LEVL comes in. LEVL’s proprietary nanosensor measures the users’ acetone concentration and is converted into fat burn by the LEVL device, all without ever stepping on a scale. Users simply blow into the tabletop device, which draws on 50 years of breath science research, and LEVL’s sensor measures the concentration of acetone in that breath, providing an individual LEVL score. The LEVL score appears on the device, and LEVL can seamlessly and immediately connect this information to an app on the users’ mobile device to provide them with real-time, predictive information. Users can compare their LEVL score with their diet and exercise choices to adjust their routine to maximize fat loss. The LEVL device will be available for sale in 2016. Additional information is available at www.levlnow.com. LEVL is on a mission to change the conversation about weight loss to one about fat loss. LEVL is a ground-breaking device that can tell an individual’s fat burning state with just one breath. Users simply blow into LEVL, and a proprietary nanoparticle sensor detects a molecule in the breath that indicates if he or she is burning fat. Armed with this personalized information, which works seamlessly with smartphones and is available immediately via LEVL’s app, users can make real-time decisions about their diet and exercise routines to optimize fat loss and wellness. Based on half a century of proven breath science research, LEVL makes monitoring a user’s fat burning state easy and predictable. All it takes is one breath. Wilke, Joy. “Nearly Half in U.S. Remain Worried About Their Weight.”Gallup25. Gallup, 25 July 2014. Web. 15 Dec. 2015.